Numerics 4 is here with Dashboard Templates, Backup & Restore and more. We are thrilled to announce the availability of Numerics 4, the biggest update to Numerics since its release! 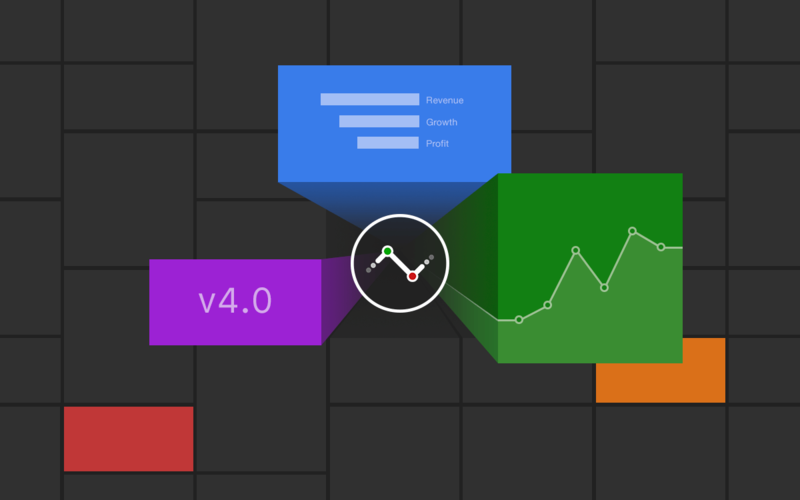 v4 packs in 2 new powerful features - Dashboard Templates and Automatic Backups, 5 new service integrations and loads of improvements and bug fixes. With a large number of updates to talk about, let’s dive right into the what’s new starting off with the new features. You can create a dashboard template from any of your existing dashboards and share it via iMessage, Email, Dropbox or any iOS communication or file handling app. The dashboard templates are designed such that no secure data or credentials are shared with the template. Just the dashboard layout and widget configurations are shared. The recipient simply taps on the dashboard template file and opens it into Numerics. A nifty import tool auto connects widgets to the recipient’s accounts and profile data. If the user doesn’t have those accounts connected already, the import tool prompts to connect new accounts. We believe the new dashboard templates provide a simple and elegant solution to numerous enterprise requirements that users have reached out with. Numerics now creates automatic encrypted backups of your entire Numerics setup securely to Apple’s iCloud. You can now (finally!) restore a backup from your iPhone to Numerics on the iPad to instantly get your entire dashboard setup on your iPad. No more re-setups across your devices, configure once and have your dashboards everywhere! Backups are encrypted with user defined passwords. If you’d like to backup to a location other than iCloud, you can use the “Backup now” button to export a backup on Google Drive, OnDrive, DropBox, Box or any cloud app of your choice. The new Backup and Restore functionality provides a secure way for you to keep your Numerics dashboard configurations safe and take it with you to your other iOS devices. The Gmail connector comes with 4 widget packs and 74 widgets to help you get your things done. All Gmail widget packs are made available at no extra cost. The Priority Mailbox Stats widget pack gives you widgets to track the number of read or unread priority messages. It also gives you a breakdown of your read vs unread messages visualized in a pie chart. The Mailbox Stats widget pack gives you numbers to get a good overview of your inbox, drafts, sent messages and more. The Label Stats widget pack let you track the number of messages by your chosen label. And if you use Gmail’s categories, the Category Stats can give you an overview of your read or unread messages for a category. Pingdom is a popular website and application monitoring service that alerts you when your infrastructure is down and provides uptime stats. The Pigdom connector in Numerics is designed to give you an overview of the uptime status of your website or application. The Current Status Stats give you the last checks performed on your website or web application, so you can check status, see the last down time and more. The Up Time Stats widgets give you up time trends along with up time totals while the Response Time Stats give you an overview of the response times. The Current Status Stats and the Up Time Stats are available with the app, while the Response time Stats is an in-app purchase. The Podio connector adds yet another productivity app integration to Numerics. It comes with 2 widget packs and a total of 10 widgets. The Basic Task Stats pack gives an overview of your tasks, while the Workspace Task Stats gives the numbers of your tasks in your chosen workspace. Wunderlist integration can keep you updated about your tasks and is available at no extra cost within the app. With this version update, Numerics is becoming a paid app - Numerics will now be available at a cost to download with fewer paid in-apps for advanced users. For existing users, many in-apps that were previously paid will be made available to use for free. Numerics 4 also packs in various small improvements and bug fixes. We love hearing from our users, so if you’d like to send us a suggestion, report a bug or simply say hello, reach us out on Twitter or drop us a mail and we’ll be in touch!